Red O, the Los Angeles restaurant concept from Chicago celebrity chef Rick Bayless, will launch a second location at Newport Beach's Fashion Island on November 29, 2013. The menu will feature Bayless' takes on classic Mexican cuisine, including original dishes exclusive to this outpost. Red O, Fashion Island, 143 Newport Center Dr., Newport Beach, CA 92660, 949-718-0300. The community-centric seafood restaurant Ways & Means is launching just outside the city of Orange’s iconic Orange Circle. Chef Conrad Gallagher, whose international resume include stops in London, South Africa and New York, is overseeing a culinary concept that is patterned after the traditional oyster bars and fish houses that dot the globe’s coastlines. In addition to a rotating selection of West Coast and East Coast oysters, guest can expect shared plates and main dishes built around the sea’s bounty, like salmon rillette with red onion and lemon aioli and seared ahi tuna with wok-fried shiitake mushrooms and tofu wontons. For more information, visit www.wmoysters.com. Lunch & Dinner daily. Ways & Means, 513 E. Chapman Ave., Orange, CA 92866, 714-516-1800. Bonefish Grill, the sustainable seafood restaurant chain based in St. Petersburg, Florida, is opening a new location in the Tustin Marketplace November 19. The restaurant marks the first foray into California for the national dining venue, whose culinary philosophy is anchored by a dedication to responsible fishing practices. As is the case with the other locations, this space will feature a host of daily hand-cut fish items along with steaks, pasta, chicken and pork dishes. Bonefish Grill, 2915 El Camino Real, Suite 3040, Tustin, CA 92782, no phone available. Fleming's Prime Steakhouse & Wine Bar in Newport Beach is offering a 35-oz. Tomahawk dinner for two for $99 from October 21-November 15. Dinner begins with a choice of French onion soup or Fleming’s “New Wedge Salad” with grape tomatoes, crispy onions, caramelized bacon and blue cheese. Next, the 35-oz Prime Tomahawk steak for two is carved tableside. Guests must make online reservations to enjoy this two-course prix-fixe menu. The price excludes tax, gratuity, side and suggested wine pairing. 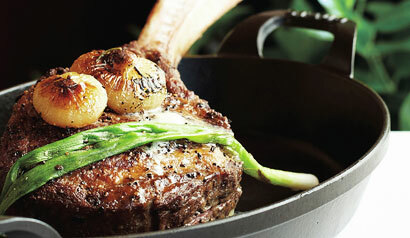 Fleming's Prime Steakhouse & Wine Bar, Fashion Island, 455 Newport Center Dr., Newport Beach, CA 92660, 949-720-9633. Manfred Lassahn has taken over as executive chef at The Californian, the flagship dining venue at the Hyatt Regency Huntington Beach. Lassahn, who trained in Germany, comes to the oceanfront venue after accumulating nearly three decades worth of experience in other Hyatt properties in Southern California, including the Hyatt Regency Long Beach, Hyatt Regency Valencia and Hyatt Regency Century Plaza. The Californian, Hyatt Regency Huntington Beach Resort & Spa, 21500 Pacific Coast Hwy., Huntington Beach, CA 92648, 714-845-4776. The Balboa Bay Resort has welcomed Vincent Lesage as its new executive chef. Lesage has taken over the culinary operations of the Newport Beach waterfront resort from Josef Lageder, who retired in September. The Paris native’s resume includes several restaurants in France, as well as his most recent stint as executive sous chef at the nearby St. Regis Monarch Beach. Balboa Bay Resort, Balboa Bay Resort, 1221 W. Coast Hwy., Newport Beach, CA 92663, 949-645-5000.